The Walker Replacement Crew R-41 arrived at North Pickenham in July. They came as a nine-man crew, as their bombardier had been cut from their roster. Perhaps he was put into the Bombardier Pool. After a little in-house training they were assigned to the 859th BS, designated as Crew 901. The records concur with the crew's count that they flew 3 missions. We have read a short summary on this crew which states that two of the crewmen were replaced. We have them identified below as the two PFCs listed under "Others Who Flew..." Perhaps these men were original members of this crew when they came to England. But the official transfer order assigning this crew to the 859th is what we used to make their roster, as shown below. 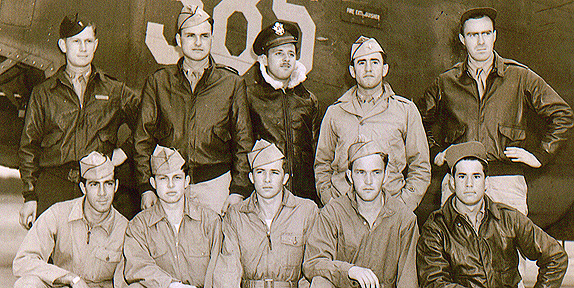 On their third mission, 21 Jul 44, they flew as a nine-man crew. It was a bombing raid on an Me-410 assembly plant near Oberpffaffenhofen, Germany. As the Crew was approaching the target they began experiencing problems with two of their engines. Then the tail gunner's turret suddenly quit working. They realized that the extra strain on the two good engines was burning up too much fuel. They knew that they wouldn't have enough fuel to return to England from such a long mission so they opted for Switzerland. After crossing the Alps the Swiss Air Force found them and escorted them to Dubendorf for internment. MACR 7260.